Viva Palestina USA, an offshoot of British MP George Galloway's anti-Zionist, pro-Hamas, Viva Palestina convoy initiative, crossed into the Gaza Strip on July 15th, 2009, with 200 Americans as well as more than $1 million worth of aid for Palestinians in Gaza. 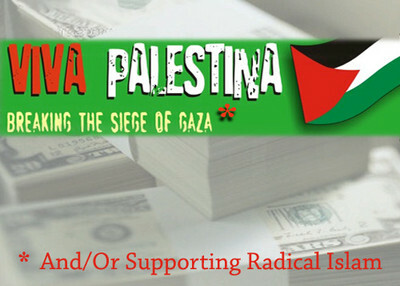 Viva Palestina USA claims to be a humanitarian initiative desiring to help needy Palestinians. But behind the headline-grabbing trip, events prior to, during and after the trip reveal the anti-American, anti-Israel, revolutionary and pro-Hamas sentiments of its organizers. When Galloway led a Viva Palestina UK convoy to Gaza in March, he started out with 110 trucks filled with supplies. That doubled during a stop in Libya when the Gaddafi International Charity and Development Foundation donated a matching volume of supplies. The Foundation's chairman is Safi Saif Al-Islam Gaddafi, son of Libyan dictator Muammar al-Gaddafi. Once in Gaza, the convoy was greeted by Hamas representatives. Viva Palestina UK gave thousands of pounds of aid and tens of vehicles to the Hamas government. The convoy also included 12 ambulances, a fire engine and 1 million pounds (approximately $1.4 million U.S.), which was given to Ziad al-Zaza, the Economy Minister of the Hamas government. In July, Viva Palestina USA led a similar convoy to Gaza, with more than $1 million in what organizers said were medical supplies. There, Galloway and a crew of approximately 200 Americans met with Hamas leader Ismail Haniyeh, who praised the U.S. convoy as "proof that the American people is not entirely a people of occupation and is not entirely on the side of the criminal Zionist regime." U.S. law prohibits providing material support to Hamas, even when that takes the form of humanitarian aid. Five officials at the Holy Land Foundation for Relief and Development (HLF), a now-defunct Texas charity, are serving prison terms ranging from 15 to 65 years for violating that law. In that case, jurors found that HLF routed more than $12 million to Hamas through a network of charities controlled by the terrorist group. It is unknown whether Viva Palestina's delivery of goods to Hamas officials is under any kind of investigation. However, attorneys with National Lawyers Guild attended Viva Palestina events and provided training on how to respond to government questions. "I just want this to be clear to the FBI man [in the audience], I am not, myself, a supporter of Hamas, I have never been a supporter of Hamas." He invoked the memory of the late PLO leader Yassir Arafat, whom Galloway said was a close, longtime friend. But Galloway has now twice led convoys which delivered tons of supplies and millions of dollars to Hamas instead of to non-governmental organizations. And this picture seems to challenge his claim about Hamas. The Kansas City fundraiser, one of many throughout the country, raised $103,000 in a single evening. The next night, at an event in New York, City Council member Charles Barron started his remarks by leading the crowd in a chant of "Long live Palestine." Then he introduced himself by saying "I am not a politician. I am an elected revolutionary." Barron, a former Black Panther Party member, was part of the convoy heading to Gaza along with his chief of staff, Nayo Joy Simmons, and a second staffer. Barron spoke of former Congresswoman Cynthia McKinney, who was supposed to appear at this convoy send-off, but she was in Israeli custody, after a boat she was traveling on toward Gaza was seized by the Israeli navy. "And how dare you, Barack Obama, how dare you go to Africa, kill three Somalians for trying to protect their water when an American boat went into Somalian waters. They tried to protect their waters from dark, toxic waste being dumped and for you ruining their maritime, their fish, stealing over $300 million worth of shrimp, and other kinds of fish, starving the people of Somalia, you go and kill three Africans to save an American ship and you're silent on the Israeli government taking a ship" carrying humanitarian aid to Gaza. A short time later, Father Luis Barrios told the convoy travelers to, "Break the law. Just break it. OK?" "Is it Hamas that's denying children IVs and medical supplies while they lie in hospitals dying? Is it Hamas that put these children in the hospitals in the first place? No. Is it Hamas that destroyed half of the hospitals in Gaza…and is it Hamas that put Cynthia McKinney in jail?" "I promise there will be another intifada. You think our children are scared to be martyred?" "Let the message of Shahid Ahmed Yassin revive," and "I'm your everyday martyr, your everyday fedayeen smashing away the Zionist dream. Their claims are all fraud. They were the chosen until they started worshiping Satan instead of God." Yassin was a Hamas founder and its spiritual leader until he was killed by Israel in 2004. Mahdi Bray, the leader of the Muslim American Society (MAS)'s Freedom Foundation, was a featured speaker for the majority of Galloway's and Viva Palestina's fundraising events. Following the radical rap at the American University fundraiser, Bray applauded Ibrahim, encouraged audience members to purchase his CD, and stated, "I like the courage." Bray further noted that the audience comprised a small group (approximately 60 people) because Muslims are afraid of what the "White House" will think if they supported "the struggle of our brothers and sisters in Palestine." To this, Bray said, "The hell with going to the White House. I don't want to go the White House if my Palestinian brothers and sisters can't live in their house." In addition to co-sponsoring fundraising events, MAS Freedom has openly supported the efforts of Galloway and Viva Palestina on its website, provided a container of medical supplies and equipment for the convoy and launched the "Let Gaza Live" and "End the Gaza Embargo" campaigns to complement the efforts of Viva Palestina. CAIR, as previously noted, sent representatives on the U.S. convoy, and has additionally promoted the efforts of Viva Palestina USA on the web. On July 14, 2009, CAIR-LA forwarded an action alert from American Muslims for Palestine to its list serve demanding that Egyptian authorities allow the Viva Palestina U.S. convoy passage into Gaza. On July 1st, 2009, CAIR National distributed a press release calling on the Obama Administration to release Cynthia McKinney and 20 other members of the convoy after they were stopped by the Israeli navy. Among those joining McKinney in the Viva Palestina US convoy were New York City Council Member Charles Barron, representatives of the extremist anti-Zionist group Neturei Karta, the Middle East Children's Alliance, Cuba Coalition, Malcolm X Grassroots Movement, Movimiento Estudiantil Chicano de Aztlán (MEChA), International Action Center, International Socialist Organization, Workers World Party and the Answer Coalition. After returning to the U.S., Viva Palestina supporters met in Brooklyn on July 27 to discuss their trip. They met at the Salam Arabic Lutheran Church, where Archbishop Hanna said he supports a one-state solution, that the idea of a two-state solution is unjust and is an illusion. An interpreter summarized his statements. "We have to be patient. We are in no rush in any way to get to any solutions. We're here to wait. We can wait another 50 years. We can wait another 100 years, as long as we find a just solution, which is a one-state solution, the right state for all its citizen, every person living there – Jews, Christians, Muslims, and see the end of the Zionist regime that racially discriminates and occupies Palestine now." Many of the convoy participants gathered at the Salam Arabic Lutheran Church in Brooklyn on July 27 to discuss their experiences. Archbishop Atallah Hanna of the Greek Orthodox Patriarchate of Jerusalem echoed the sentiment from previous events that the Viva Palestina supporters oppose a two-state solution to the Israeli-Palestinian conflict and demand one Palestinian state, with Jerusalem as its capital. "Historic Palestine from the river to the sea; that is Palestine. Therefore, friends, we must not talk about the people of '67 or the people of '48. The Palestinian people are one people, no matter where they are or where they are found. The Palestinian people are one people indivisible." Calls for a Palestinian state on 1948 borders (before there was a state of Israel). Direct contributions to Hamas officials. On Friday, Viva Palestina issued a statement announcing plans for a "mega convoy" in December with "more high profile individuals" and much more money and supplies. Viva Palestina's actions in support of Hamas seem to echo those of HLF, if not more boldly at that. It will take less that 50 or 100 years for them to realize that historic Palestine from the river to the sea is the State of Israel. If the Palestinian people are one people, then why they are killing each other? At least these anti-Semites and anti-Israel telling us what they have in mind: oppose a two-state solution to the Israeli-Palestinian conflict and demand one Palestinian state, with Jerusalem as its capital. Good dream they may wake up one day from with a bump on the head or hand cuffs.